To End Poverty - What Is the Purpose of Life? This Thanksgiving, I am grateful that I don’t live in physical poverty. But the poverty of the soul still lingers within me. Just because I have plenty of food to eat, a roof over my head, clothes on my back and endless opportunities for distraction and entertainment, does not mean I have escaped poverty. Just because I escaped physical poverty doesn’t mean life is all peaches and cream. Why is that? Most of you will not know what I mean. But for some you, this may strike a chord. And if it does, the New Message from God explains this condition of “inner poverty” in a new revelation. The New Message highlights the inner poverty of my soul. The Poverty of not living with purpose and meaning. Living a life of quiet desperation; working a job and working for very little reward beyond supporting me and my family. 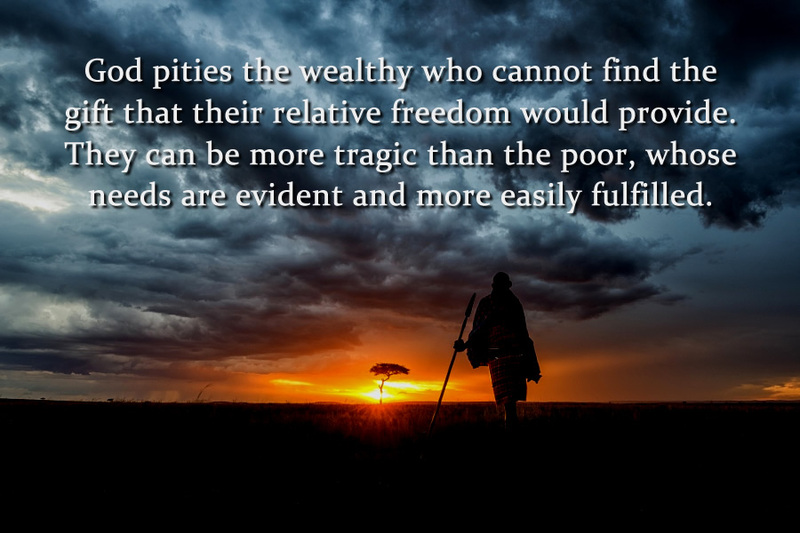 This is a deeper poverty that afflicts millions of people. The extreme cases of this inner poverty is seen in addiction, criminal acts, depression and obsessive behavior. It all stems from the same inner poverty, poverty of the soul. That is what we work towards when we quietly contemplate our actions. That is what we work towards when we build relationships of common purpose. That is what we work towards when we help others in real need of food, clothing and shelter.